Event Description : MUSIC : The Grand Old Dog Live! 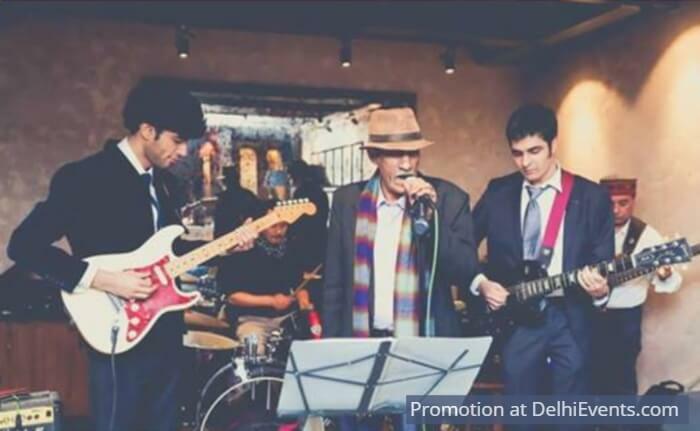 The Grand Old Dog is a progressive jazz-blues outfit from Delhi. It features an authentic horn section, Chicago-styled blues harmonica and guitars from the Delta. The recently formed five member team has met with unprecedented success among city gig goers for their unique music style. Founded by Udayraj Singh and Gautam Lahiri in early 2013, they have played at some of the biggest gig venues in the city such as Blue Frog, Raasta, Café OTB, Fat Ninja, café 79, Attitude, Café 27, Turquoise Cottage, among others. Udayraj has been playing guitar and harmonica professionally for more than two years. Formerly, he would play with Strange Weather, a jazz-rock ensemble, with some of Delhi’s well-known jazz and blues musicians. Udayraj has also trained under top New York Latin jazz guitarists such as Juancho Herrera and Yuri Juarez. Gautam has been a professional musician for more than 35 years now. He has performed in a number of music festivals, pub gigs and corporate events at venues such as Hyatt Regency Delhi, Clark Shiraj Agra, Blue Frog and Benigans Grill. He is also the creator of a successful online group on Facebook called the “Blues World”, which has more than 14,000 members from all over the world contributing, sharing and promoting blues and jazz music and trivia. Gautam was also a part of Rain, a blues-rock group in the ’80 and early ’90 that met with wide recognition and popularity. Chips, aka Chidamber, is a veteran jazz musician. His musical journey began with High, touted by many as “India’s golden era band”. He has also featured with Lou Hilt of HFT fame, who is recognized as one of India’s top bass players. Chips along with musician Zohra Shaw formed Capital City Minstrels, Delhi’s finest choir group. He plays the saxophone and other assorted wind instruments. Junior, aka known as Sudatto, is an electric blues bass player and has been performing for more than 25 years in groups such as Rain and Fuzzy Logic. He has also featured with Anindo Bose from Advaita. Sudatto is also the band’s sound technician and engineer. Amit Gurung is a drummer who is a well known name in the indie Kathmandu music scene for the past several years. He has played in festivals such as Visit Nepal and Kathmandu Street Festival with his former rock band, Antim Grahan. Amit was part of Jigni’s Jazz Trio which would play at Jazz Upstairs Club in Nepal. He is also doing sessions work for artists such as Avi and the Uprising on the Side.